This BioProvince (as defined by Armen Takhtajan) comprises much of Thailand together with the western parts of Laos and Tenasserim (Burma). As with other parts of Southeast Asia the climate is profoundly influenced by the monsoon and consequently there is a distinct dry and wet season but being in the tropics the temperatures are consistently high and both annual and daily temperature ranges are comparatively small. Geologically the area is very rich. Much of the western mountains are covered in Siluro-Devonian and Carboniferous material characterised by calcareous shaly and sandy faces, while the eastern mountains are dominated by Permo-Triassic and Cretaceous conglomerates and sandstones. There are also conspicuous north-south bands of Triassic outcrops and in the valley basins Querternary-Tertiary alluvium and terrace deposits are common. The flora has several endemic genera including Aetheoliron, Antheliacanthus, Campylopetalum, Dimetra, Dossifluga, Graphandra, Larsenia, Paravitex, Plegmatolemma, Polypleurella, Thysanostigma and Zygostelma, and many endemic species. 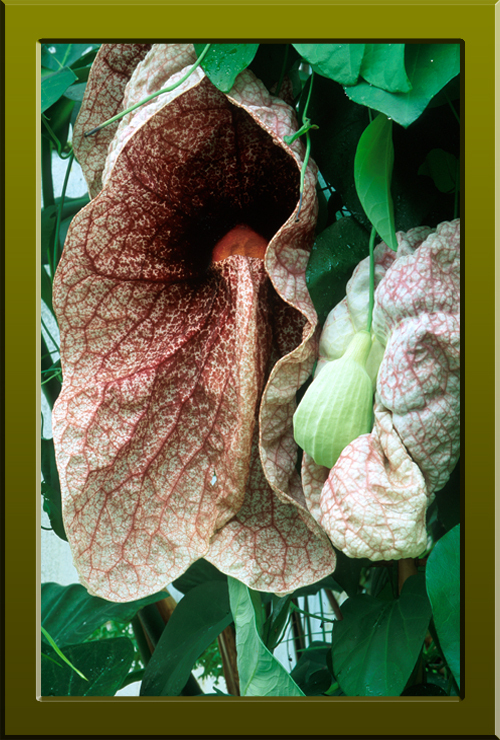 Aristolochia grandis (Aristolochiaceae) a strange vine endemic to the evergreen forests of Thailand (Copyright © 2010 Peter Martin Rhind).